I watched a curious video from Bushcraft412, an outdoor survival guy. He says many of us (preppers) aren’t prepared despite having tons of stuff stocked up. He says many preppers are rigid, trying to hold on to our lifestyle. He says flexibility is key. He promotes primitive living. He asks: What happens when our supplies run out? As a moderate prepper, after three to six months, I fully expect that things will return to “normal” after most disasters. I don’t believe society will revert to a primitive state for a long period of time. Supplies can usually carry you through. He has a valid point though: it’s good to learn new skills. We aren’t going to head for the hills and live off the land for an extended period of time after most disasters. Hurricane Sandy was rare in that it was a November hurricane. It was followed up by cold weather and snow. Preppers in northern states should give some thought to heating their home during an emergency. There are many options. For those in the country who rely on heating oil, you’re basically all set. One issue with storing hundreds of gallons of heating oil is the danger of a leak. Here is a nice pdf about minimizing that risk. You can find an array of heating options on Northern Tool. One that looked interesting (but too expensive!) was a pellet stove that fit in a window, like an window air conditioner. It would let you heat a small room. I bet a lot of heat is wasted with such a unit, and I’d worry about fire issues, but on the upside, it draws its combustion air from the outside, which is a nice safety feature. The unit has a blower, so you’d need to be able to generate some electricity. For the ultra-low-budget do-it-yourselfer, Northern has a door, legs, and piping to let you make a wood-burning barrel stove. Safely rigging up this stove in an emergency would be the big issue. Between the $1,400 window pellet stove and the $40 stove kit, Northern has other stoves and heaters to give you ideas for providing heat during disasters. You can be a rich prepper or a poor prepper, but you shouldn’t be a cold prepper. Like many urban preppers, I have little use for diesel fuel in my daily life. Diesel fuel has much in common with heating oil, although they’re not usually the same. For preppers who want to store substantial fuel for a generator, diesel is one option. It keeps a long time. It’s less flammable than gas. Here is a video comparing the flammability of diesel to gasoline. In Minnesota, a 64-year-old fellow had repeated trouble with teenage prowlers seeking drug money breaking into his home. He shot two of them and is now facing murder charges. When his Mini-14 jammed, he used his handgun. It’s a sad story. I feel bad for both sides. The teenagers shouldn’t have broken into his home or tormented him. If you must defend your life, it’s important to be prepared for events that occur after the shooting. Most serious defense courses teach this. Many of us have been taught to shoot and keep shooting until an attacker is down, but realistically, firing six or seven shots into an attacker can put us in legal peril. It looks like we’re being needlessly aggressive. This is one advantage to a shotgun, one blast is usually effective. Once an attacker is down and no longer a threat, stop shooting. Another thing: Call the police and an ambulance immediately. This event happened on Thanksgiving and the guy didn’t want to bother the police on a holiday. He contacted them the next day. He might have been in shock, but as a rule, don’t let bodies lie around the house for days. That creates suspicion. Final basic point: Don’t move bodies. Authorities don’t like that. It’s probably best to immediately contact an attorney if you think you might need one and have them present during questioning. If at all possible, you never want to fire on somebody if you can avoid doing so to avoid possible legal problems. U.S. Rifle, Cal. 7.62MM M-14 Operation And Cycle Of Functioning (1960). This video has a really nice (nearly 30 minute) discussion about the operation of the M1A type rifles. It explains the basic operation of gas-operated semi-automatic rifles really well. (8:41 is the start of explanation of how gas operation works). It goes over how selective fire on the M-14 works, at a basic mechanical level. As most preppers know, the M-14 is the select fire version of the Springfield M1A. This video comes from a guy (alaskabearhawk) who’s building his own airplane! An ambitious project for those interested in knifemaking is his five-part video about how he built his own 2 x 72-76″ belt grinder. These things usually cost upwards of $500, so building your own can save some coin. Bodybuilder Scooby has a Youtube video about staying fit and healthy after age 50. He makes an important point: We must keep our brain fit by learning new things. If you want to keep your brain at its best, consider taking up dance. This article (stanford.edu) discusses the benefits of dancing. Well, home heating oil to M-14s to feral kids to dance. That’s about it for today’s post. For ‘preppers,’ every day could be doomsday (usatoday story). This Youtube video is from a prepper about approaching Sandy. The reason I linked is because he says something interesting (that has been reported in several news stories recently): When flooding occurs, the ground trees grow in is loosened, making them more likely to topple. This is an older link about building an AK-47. (zombiehunters.org) Pretty pictures if you like guns. Here is an interesting discussion for those who want to make their own knife by the stock-removal method. 1. Do what the authorities say. Evacuate. Some preppers won’t like hearing this, but the officials often know best. At a minimum, keep informed. If the news reports a storm of biblical proportions is bearing down on you, take a vacation. Visit the in-laws. 2. Store water for drinking. Many residents in New York and New Jersey lost a source of reliable drinking water. Relief agencies provided water, but what would happen if the relief agencies couldn’t even do that? It’s good to have some water for washing, too. 3. Store some food, at least a few days. Relief agencies provided hot meals to people, but it’s easier on you and your family if you have your own reserves and have thought about how you’ll cook them. 4. Allow for a power outage. Nearly 8 million peoples’ power was knocked out. Many went ten days without power. The amazing thing here is just how quickly power was restored to so many areas. Some preppers harp of society being fragile, but societies usually are resilient, too. For most of us, we can get by without power or we should have a generator. 5. Learn about tangential safety concerns. This is a big part of the book. Carbon monoxide is a good example. Several people have died or become sick because they weren’t fully aware of the dangers of CO. They purchased a generator, but failed to understand the CO issues involved. They built fires in the chimney, only to have CO make them sick. One difference between a newbie prepper and an experienced prepper is being aware of these side issues that cause a loss of life or further property damage after a disaster. 6. Prepare for delays. Many people sat or stood in line for hours to get gasoline. Traffic lights were out and traffic moved slowly. Does this mean urban preppers should store a lot of gasoline to avoid the lines? Not necessarily. When prepping you must weigh the costs and risks of making a preparation against the benefits. For regular gasoline, keeping 100 gallons of fuel in your garage invites new risks. What if a tree brings down a power line right across your garage? With the extra fuel, you’ve just lost your garage and, perhaps, your house. 7. Prepare for home damage. Hurricane Sandy damaged homes with wind and water. Falling trees made a general nuisance of themselves, taking down power lines and starting fires. Some just cozily plopped themselves down on a living room couch. It’s good to know about your home’s construction and its systems, to know what repairs you can make and to know when your home is simply unsafe and you must leave. I’m really looking forward to a new blogger over at tracemypreps.com who will write about home structure and preparedness, an important topic that doesn’t get that much attention. 8. Allow for prescription medications and special preps for the elderly and children. Elderly people who needed elevators in their high-rise buildings in New York to get up and down were trapped when the power went out. Volunteer runners who were slated to participate in the New York City marathon ran up and down stairs delivering prescriptions and meals. 9. As far as reasonably possible, test your preps or have a well-thought out plan. One major story involved a hospital where infants depended upon electrical life-support. When the hospital’s backup generators failed, the nurses carefully evacuated the babies while manually beating their hearts. It’s often when you’re at the end of resources when character and resiliency really show. Some generators in basements failed because of water. Yes, water will get into your basement during a flood. Powerful pumps can reduce the level. This doesn’t mean you should flood your basement with a garden hose to see how well things go! Nor should you needless transport real premature babies just for practice. 10. It can happen to you. Too many people feel disasters only affect others. In one story I read, thousands of special genetically-engineered lab mice died because they were left in a university basement. Hurricane, flooding, animals in the basement…hmmm…. You don’t need a Ph.D. to realize that’s not a good combination. Now I’m not trying to start one of those save-the-mice versus save humans political-moral conflicts. But somebody was responsible for that situation. Almost certainly, they didn’t really believe the flooding would be that bad, or they would have taken some preparations to protect the mice. One of the biggest reasons to prep is that the process of prepping gets you to think through unpleasant scenarios. If they do happen or even if other horrible scenarios come to pass, you’ll be better prepared mentally to take action. You won’t be in a state of denial or dismissal. 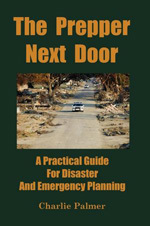 Charlie P.-author The Prepper Next Door: A Practical Guide For Disaster And Emergency Planning. Here’s a news blurb about natural gas leaks, a too frequently neglected topic. Another update. This guy “preps” in style, with wine and shrimp! Here’s a good story about the risks of CO and generators. If you purchased a generator for emergency use and aren’t familiar with carbon monoxide risks, please read this story. Here’s a short guide for hurricanes (pdf) (from an energy company). Here’s a very short how-to blog post about living without power after a storm. One subject I wanted to discuss in the book but didn’t have room was the dangers of arc flash and electrocution. Obviously, just stay away from downed power lines! If you’re turning on a main circuit breaker, don’t stand in water! While most electricians will shut off power to a circuit to work on it, there are situations where linesmen or electricians must work on live electrical wires. Of course, this is not something for the average prepper to undertake. But, we can learn a bit from the pros. If you’ve come home after a hurricane and your house has flooded, and you turned off the main circuit breaker when you left, and are now turning it back on, a few precautions don’t hurt. The key idea is to be sure you’re fully insulated, so current doesn’t find a path through you to ground. Some electricians like to follow the rule that they want three levels of protection. For example, they’ll use insulated tools, adequate rubber-soled boots, and stand on an insulating rubber mat. When flipping the breaker back on, it doesn’t hurt to put on rubber gloves and stand on a rubber welcome mat. These measures aren’t as good as what the professionals use but are certainly better than taking no precautionary steps. Let your system dry out and, if in doubt, hire a professional to inspect your electrical system. This pdf is a basic guide to electrical safety. Well worth reading, even if you don’t work with electricity. Dan at the TheDailyPrep.com just reviewed The Prepper Next Door. Distracting and boring? Ouch. I really tried to write it so it would be entertaining and lively. Anyway, check out the review and Dan’s site TheDailyPrep.com. It’s a great blog with videos and practical advice for preppers. He has a video about the dangers of radon, which is an important topic for many homeowners.